Inspiring and changing young lives through music. Music is a powerful language that touches all those it reaches, and for those with talent it can change their lives. 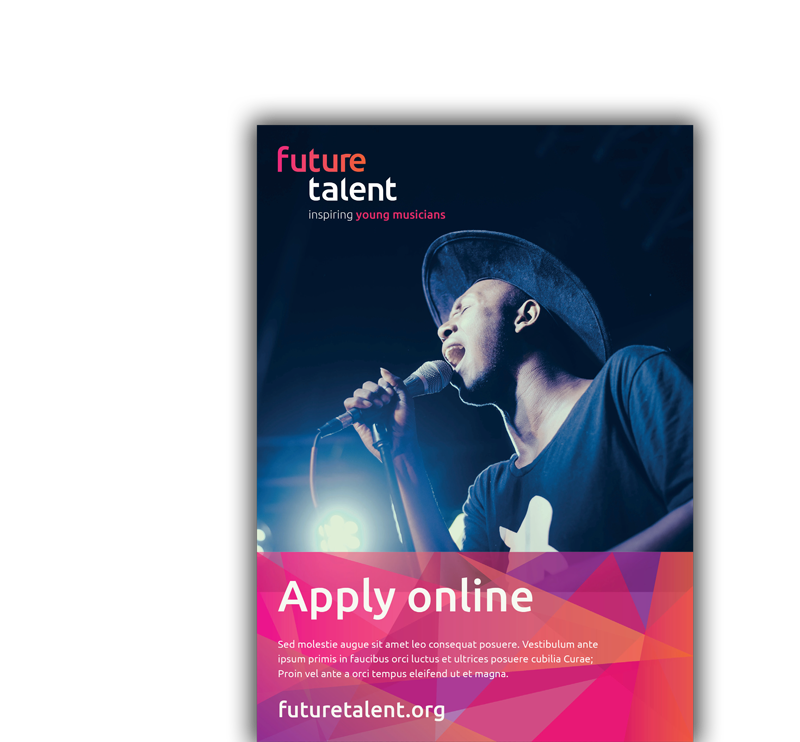 Co-founded by the Duchess of Kent, Future Talent is the UK’s flagship national charity supporting young musical talent. Future Talent supports young musicians from challenging backgrounds, who need both the financial assistance and the mentoring and guidance to reach their potential. We were delighted to be invited to help them rebrand with a new, confident identity. The charity was well overdue for a bold overhaul of their visual identity and distilling their purpose and messaging. Future Talent have absolute belief in the world-class talent of their young people. Therefore, the brand needed to reflect that confidence, and strike a professional yet welcoming tone. They were looking for a friendly and relaxed visual identity, but that did not feel childish or patronising. Most importantly they wanted their brand to feel aspirational to other young musicians; communicating the message: this could be you! Due to the way that Future Talent works, the brand needed to feel extremely personal and focussed on the individual. Their model is not for ‘the masses’; it is highly tailored to individual young musicians and supports them 1-to-1. They also work with a very diverse range of musicians in terms of age, background and musical instrument. All of this needed to shine through the new identity. We started by identifying the goals of the organisation, and distilling the message that Future Talent were communicating. Working closely with the project lead at the charity, we identified all of the essential touchpoints and gained a full scope of the brand requirements. Following this, we went through a very extensive and detailed design process. This allowed us to explore multiple routes in depth, all informed deeply by the original research phase. Having identified colour schemes and tone of voice, we had some loose guidelines, but free reign over developing the brand style. We explored a huge range of options; designs inspired by flowing musical staff of sheet music, options that were purely typographic, and styles that reflected music shapes such as sound waves, audio signals and even the curve of instruments. However all of these felt too prescriptive and tied towards specific types of musical instrument or genre. One of Future Talent’s challenges was communicating all the different ways that they support young musicians. Our solution was to develop a new, flexible strapline that allows them to communicate the scope of their work. The tagline rotates between all of the different work that Future Talent delivers (supporting, developing, listening, giving opportunities etc). But, at the heart of everything, lies the young musicians themselves. This flexibility allows the charity to focus on different messages depending on the application. Ultimately we simplified the routes again and again, until we reached their most basic foundation; a simple typographic style that is supported through strong visuals and colour palette. The ascenders of the letters all point forward as if in motion, into the future. The colour scheme is contemporary and extremely bold, providing a bright yet modern style for imagery. Finally, a background pattern inspired by stage lights provides an abstract, elegant visual device for design applications. Whatever the size of your business or organisation, we can help you achieve your goals. Get in touch today to find out how we can work together. Do good work. Work for good. Have fun.